A Barn Dance (or 'Ceilidh') is a great way of celebrating your special occasion. This lively folk band will play you a wide range of foot-tapping music, whilst our 'caller' leads you through the steps. 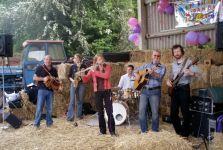 The'full-bodied' 6-piece line-up features melodeon, flute and saxophone for melody and harmony, with rhythm guitar, bass guitar and drums in the rhythm section.